AMD’s “Athlon” line of APUs gets a shot in the arm with Ryzen and Vega, delivering some genuine value to the entry level PC market. 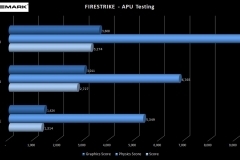 There is a legitimate space in the sub $100 CPU market for budget systems that have a little extra in the graphics department. The 2200G brings 4 cores / 4 threads with 8 Vega graphics cores and a price tag of $155. Although worth every cent of its asking price, the 2200G is still overkill for people that have very basic needs such as office use, email, internet, movies/YouTube and some very light games/entertainment. This is where the Athlon 200GE APU hits the mark perfectly with a little under half the spec of the 2200G at a much lower price. 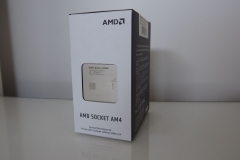 The Athlon 200GE uses the same AM4 socket as the Ryzen CPUs so from an upgrade perspective it means that system builders can keep their options open and upgrade relatively cheaply should their needs change. This APU is sporting dual 3.2GHz Ryzen cores with Simultaneous Multi-Threading (SMT) providing 4 threads to execute instructions in parallel. The number of threads is important as some applications/games won’t actually run with less than 4 logical cores – this design addresses that requirement. 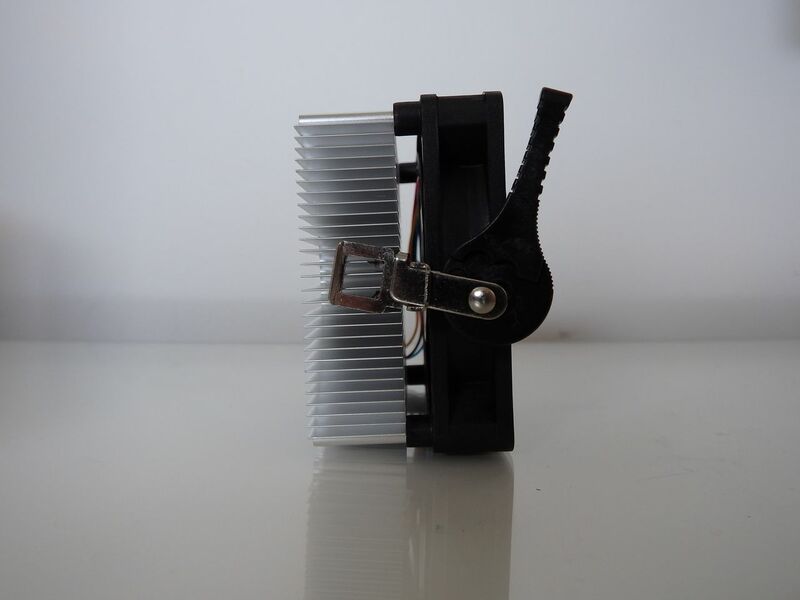 This is a 35W part with a locked multiplier – it’s designed for OEM use and needs to run at consistent temperatures and power draw. You want to overclock and tinker? The Ryzen 2200G is your entry level tinkering APU for overclocking, memory tweaking and custom cooling. 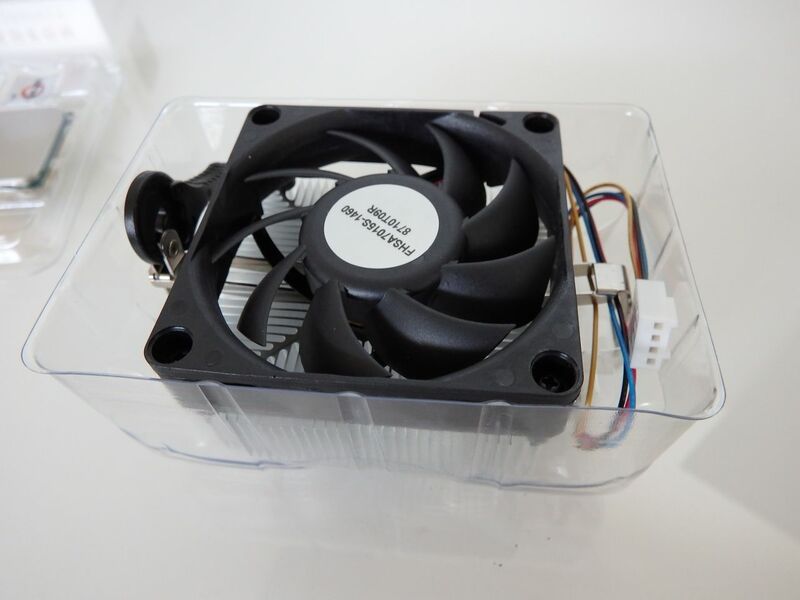 The Athlon 200GE’s 35W TDP also means that the cooling requirements are modest – and when you look at the stock cooler, it’s basic but effective. 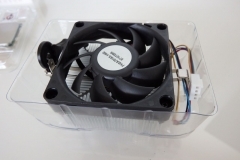 The stock cooler isn’t a fancy Wraith design by any means but it does the job and isn’t loud. I wasn’t impressed with the cooler at first glance, but after using it for a month I can’t complain. 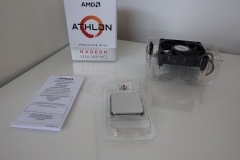 I also water-cooled the Athlon 200GE just to make sure and the performance was identical. AMD didn’t intend for users to overclock this CPU, hence the multiplier is locked, as is the memory support where it tops out at 2666MHz. You can use faster memory in your system but it drops back to 2666MHz. Locking it down makes the APU predictable and reliable. It will run to the spec, delivering a thermal profile that meets the needs for OEM and entry level systems. 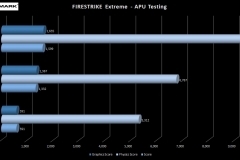 If this part allowed overclocking, it might disrupt AMD’s own product stack in terms of pricing, value and positioning. There are some motherboards that are able to get around the restriction but for the purpose of this review, we’re looking at the Athlon 200GE with the view that it’s a locked processor. If you are interested in overclocking the 200GE, check out the videos from Gamers Nexus and Hardware Unboxed on YouTube. Personally, I’d love to have seen this APU unlocked but when considering who this processor is for, I can’t begrudge AMD for forcing the spec. 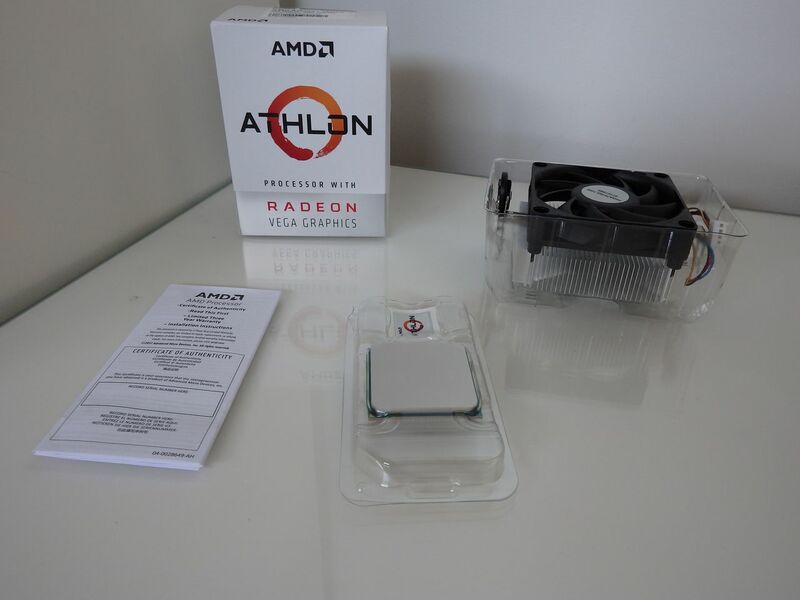 Right then, who is the Athlon 200GE for? 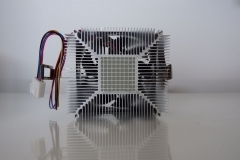 Cash-strapped light gamers who can’t afford a better CPU – for now. The specification table below shows where the Athlon 200GE sits in relation to the other Ryzen APUs recently released by AMD. The drop to two physical cores and three Vega graphics cores is more significant than the CPU clock speed which is a respectable 3.2GHz. I benchmarked the 200GE against the 2200G and 2400G Ryzen with Vega to compare the performance stepping given that the architecture is very similar. 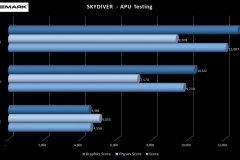 The stock cooler and Vega 3 integrated graphics were used in comparison to the other APUs. 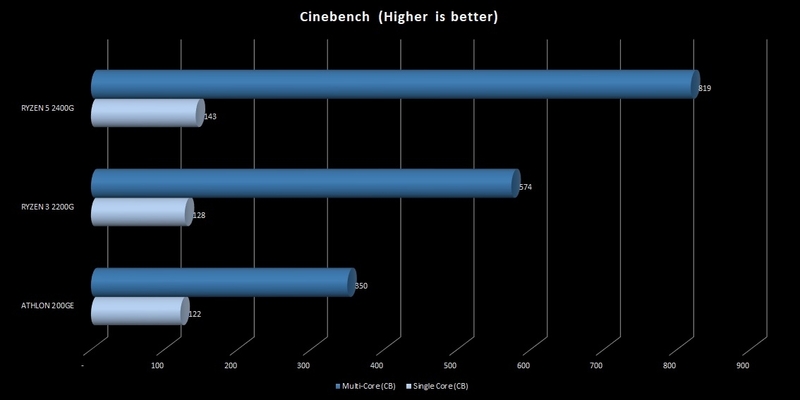 Cinebench tests showed that the Athlon 200GE almost kept up in single core benchmarking but fell behind in multi core as expected, with less cores available to process the data. 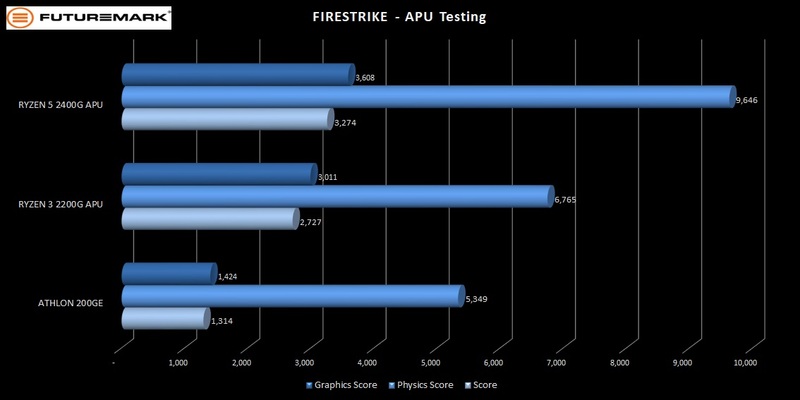 Futuremark benchmarking is probably the most indicative of the product stack. With the above in mind, it makes sense that the gap between the 2200G and the Athlon 200GE is larger due to being limited to dual cores (despite having 4 threads available) and only 3 Vega graphics cores. The performance is what I expected and sits perfectly in line with the technical specifications and capabilities of the APU. 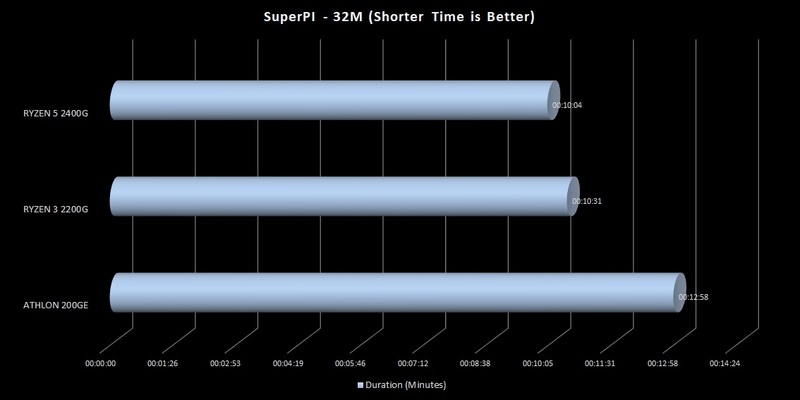 SuperPI testing also showed the impact of a lesser clock speed. The difference was slightly larger than I’d expected taking about two and a half minutes longer to complete than the 2200G. 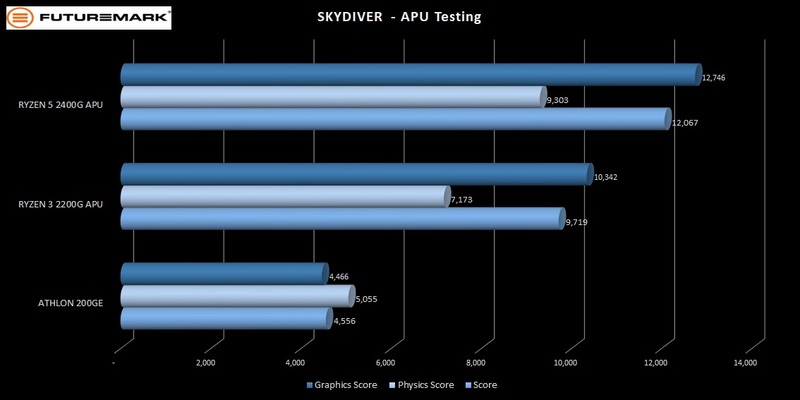 All up, the results were what I was hoping to see and this demonstrates a good honest APU that can meet its purpose with low power consumption at a low capital cost. 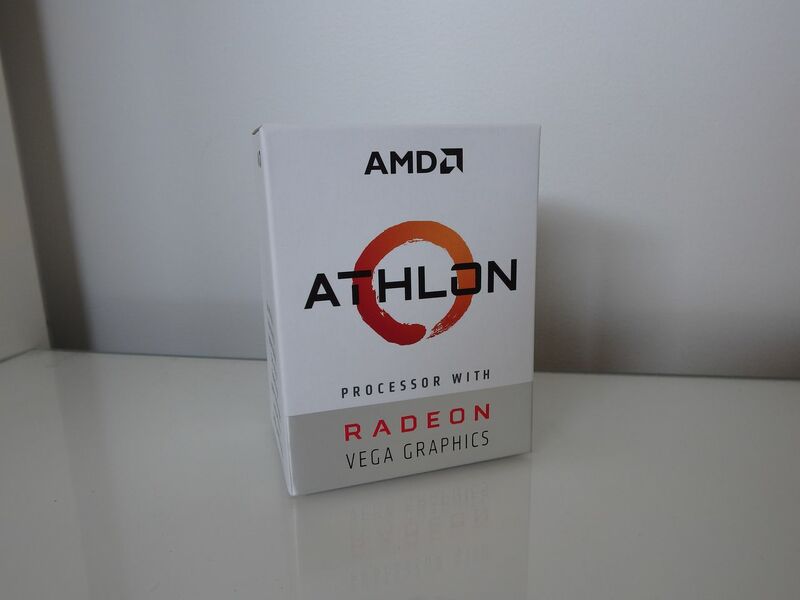 Gaming on the Athlon 200GE is ‘limited’ due to the 3 Vega cores but still pretty good for the price. My results were a little mixed but it delivers a playable experience in a number of titles where I didn’t expect it. At the end of the day, this is a budget CPU with integrated graphics that are capable of more than watching YouTube. 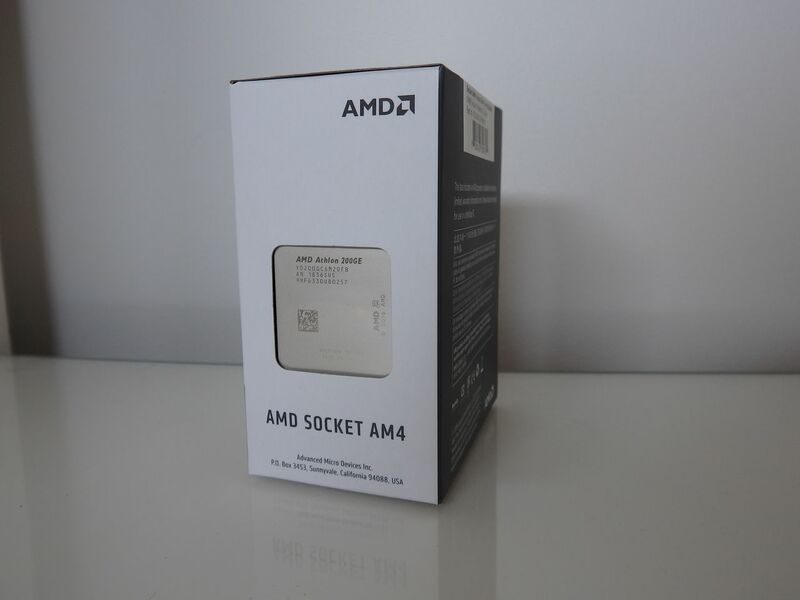 Considering who AMD created this AP for, it meets the brief easily and has more entertainment capability than anything else in the price range. We observed a total system peak power draw of only 87W (from the wall) which is lower than the idle power draw of our standard ASUS STRIX test bench with a 2700X CPU. The idle power draw fluctuated a little but was generally a little over half the peak reading in the mid 40’s. 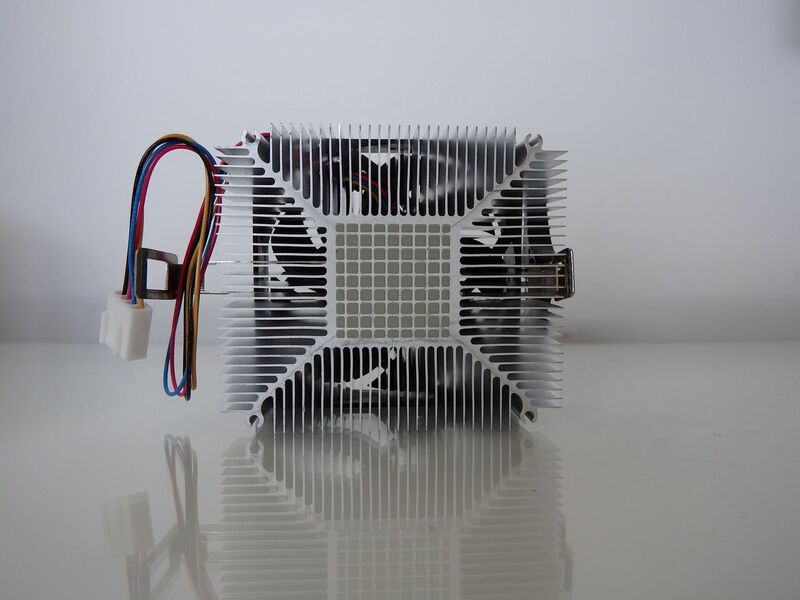 Thermally, the Athlon 200GE didn’t break a sweat at all and ticked along at 51C with the stock cooler, barely making any noise. A B450 setup would provide room to upgrade later if needed with potential to overclock another CPU that may replace the Athlon 200GE. The B450 platform also allows you to take advantage of StoreMI and ‘fuse’ a 256GB SSD with a 2TB hard drive for tiered storage that prioritises the files and programs you use the most. An A320 based system with the Athlon 200GE will provide a budget build about as cheap as you can get. The downside to this option is that it will show its age faster than the B450 alternative, has less potential for upgrading and doesn’t allow overclocking. That said, the budget A320 approach will get you going and take a dedicated graphics card if gaming becomes more important later on. Play a random indie or classic game once in a while. Given that he uses his PC maybe 3 times a week at the most, an $85 CPU and perhaps a low cost motherboard like the $79 ASROCK AB350M-HDV make a suitable option to replace his existing 12 year-old entry level boat anchor of a PC. If he gets hooked on a game and needs more from his setup later on, he can add a graphics card, or perhaps swap out to a 2200G or 2400G if the graphical requirements aren’t too heavy. I have always found the Ryzen 2200G to be an appealing value option and my preferred ‘budget’ APU. After the review there was still a sense that the 2200G was still overpowered for the entry level sector (non-gaming) and something with a little less grunt and at a lower price point would have a place in the home/student PC space that could stretch for low end entertainment and very basic games. 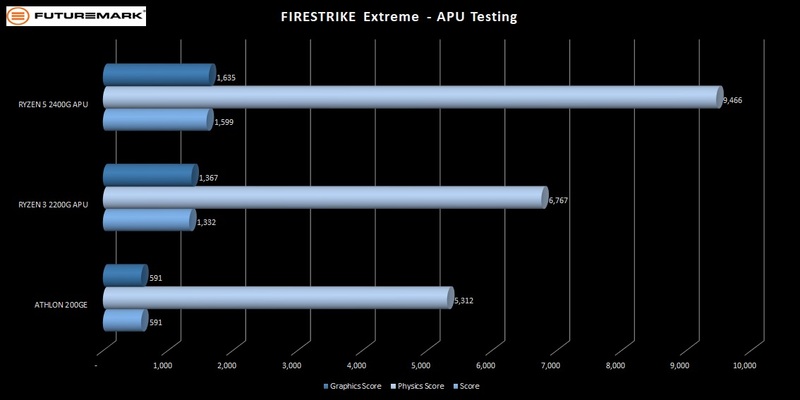 The Athlon 200GE is exactly that product. The 200GE has enough grunt to easily tackle day-to-day PC tasks, handle student workloads, some lightweight gaming and even a few Esports titles with the right settings. Ryzen owners that ever have to deal with a dead graphics card may want to consider that an Athlon 200GE APU is cheaper than a basic GTX 1030 (~$120-130) and will allow the use of any onboard video output ports. 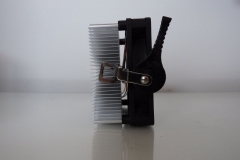 This means that you could buy one as an interim measure allowing access to emails, programs or urgent files on your PC while you wait for the graphics card RMA process to complete or a new card to arrive. This little APU is a great option at around $85 and I have no hesitation giving it the Editor’s Choice for the price point.